Snrky: It means the release is next week and we don't want to tell the business what's left. It means the release is next week and we don't want to tell the business what's left. This phrase is a personal annoyance of mine. It implies "it's not much work" or "we're almost done." It glosses over reality and fact with management speak. What are stories and work items for if not to give a precise idea of what's left. How can there be "fit and finish" if we're always providing a working product tailored to business unit expectations based on velocity and capacity? The last iteration shouldn't be any different than the one before it, or the one before that, or even the first. And unfortunately, it doesn't seem to be development hiding a bit of last minute work from the business, but a way for the business to try and stuff a lot of extra work into the last iteration that they weren't properly iterating on (and communicating) before. I use a personal example where on the last day of development for an iteration, the number of high priority items, which had been decreasing consistently as we approached release, shot up by 66 items in the last day. Over 1000%. There's no "testing party" and "fit and finish" language to cover that up - there was a disconnect between what the business said was important all along, and what they felt was important at the end. Not unexpected. But still unpleasant. Title: It means the release is next week and we don't want to tell the business what's left. 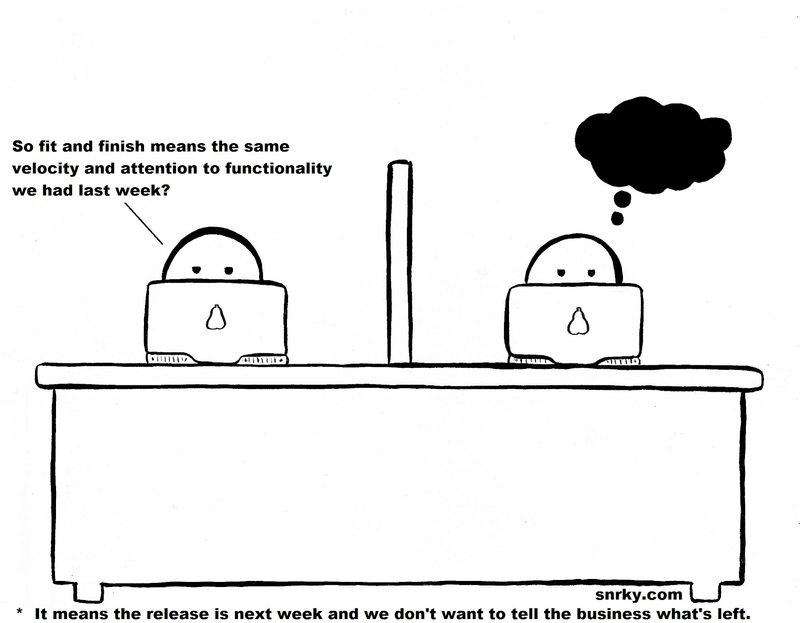 Snarky: So fit and finish means the same velocity and attention to functionality we had last week?